You've found the “U.S. Duroc Pig Breeders” page here at Hobby Farm Wisdom! If this is the first time you have visited our site: Welcome! 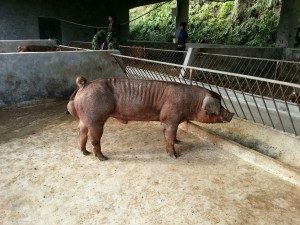 Duroc is an older American breed of domestic pig whose origins are not known. Today, Duroc pigs are most known as the basis for a large amount of mixed-breed commercial hogs. This breed has a reputation for its superior weight gain rates as well as its docile temperament, being one of the least aggressive breeds of pig. Although its ancestors were quite large, Durocs today are a medium-size pig with a large, muscular body and partially droopy ears. An orange-brownish color is the most common, although any color is accepted from light golden to dark red. Duroc sires pigs that are superior in durability, growth, muscle quality and feed efficiency.